MIMI calibrated data and browse products data is now available at the Planetary Data System Plasma Interactions Node (PPI). The data is has been marked certified with liens. The links above will go to the individual data product description below. Comma delimited files containing differential intensity in energy per charge at a 60 minute resolution in 20 day files, based on CHEMS PHA data. The units are particles per (cm^2 sec sr keV/e). Each directory contains a different particle data set. In each directory, there are separate files for telescopes 1, 2, 3 and A for the sum of all the telescopes data. Pixels are 15 % in energy per charge by 60 minutes and are based on CHEMS PHA data. The bottom axis is time covering a 20 day interval. The y-axis is energy per charge (keV/e). The color represents the differential intensity for this species, and the units are particles per (cm^2 sec sr keV/e). There are 4 horizontal panels in the plot. The top panel contains the average intensity from all three CHEMS telescopes combined. Each panel below is for an individual telescope. APL Mirror Accumulator Rates 1 min. APL Mirror PHA 1 min. LEMMS Accumulator Rates One Hour Averages: The data columns contain 1 hour averages of LEMMS accumulator rates data. The data are averaged by first defining fixed one hour intervals throughout the day and then averaging any data points that fall in the intervals. If an interval contains no data, it is still listed in the file, but all data intensity values will be fill. The fill value for data in this file is -1.0E38. There are four types of channels included in these averages. The channels A0 through A8 are measured by the low energy end of LEMMS (the Low Energy Telescope, or LET), and for protons these channels have an energy range of 27 to 4000 keV. The P1 through P9 channels are measured by the LEMMS High Energy Telescope (HET) and have an energy range of 1 to 60 MeV. Channels C0 through C7 measure electrons, and have an energy of 20 to 900 keV. The E0 through E4 channels are also electrons covering the 150 to 3000 keV range. The data are in units of intensity particles/sec/cm^2/ster/keV and do not have any background values subtracted. LEMMS Accumulator Rates One Minute Averages: The data columns contain 1 minute averages of LEMMS accumulator rates data. The data are averaged by first defining fixed one minute intervals throughout the day and then averaging any data points that fall in the intervals. If an interval contains no data, it is still listed in the file, but all data intensity values will be fill. The fill value for data in this file is -1.0E38. LEMMS PHA One Hour Averages: The data columns contain 1 hour averages of LEMMS PHA data. The data are averaged by first defining fixed one hour intervals throughout the day and then averaging any data points that fall in the intervals. There are three types of channels included in these averages: the A channels, the E channels and the F1 channels. The A channels measure ions, mostly protons. The E and F1 channels measure electrons. The MIMI instrument paper describes these channels, as does the MIMI Data User Guide. For the A channels, channel indices 8 through 62 are present (energies of 26-758 keV). For the E channels, indices 15 to 62 (20-410 keV), and for F1, 26 through 59 (206-1717 keV). LEMMS PHA One Minute Averages: The data columns contain 1 minute averages of LEMMS PHA data. The data are averaged by first defining fixed one minute intervals throughout the day and then averaging any data points that fall in the intervals. If an interval contains no data, it is still listed in the file, but all data intensity values will be fill. The fill value for data in this file is -1.0E38. Accumulator Rates & Particle Pressure Spectrograms: This plot shows particle pressure spectrograms for LEMMS and CHEMS. It also shows total pressure for LEMMS and CHEMS, and for LEMMS, a comparable energy-time spectrogram. The location of the Cassini spacecraft is also shown. The top panel shows a spectrogram of CHEMS particle pressure. The source for this data are the 32 energy steps (3 to 230 keV) for the BR0 and BR3 summed channels of just Telescope 2. This telescope was chosen because it points most closely to the now-fixed look direction of LEMMS. The intensities are averaged into 5 minute bins before converting to pressure. The units are dyne/cm^2. Note that in the magnetosphere of Saturn, the CHEMS pressures can only be trusted outside of L values around 4. The next panel is particle pressure based on LEMMS PHA ions, presumed to be protons. Channels A08 through A62 are used and cover an energy range of 25 to 780 keV. These data are averaged into 120 second bins before calculating the pressure. The units are the same as for the CHEMS data in the top panel. Note that in the magnetosphere of Saturn, the LEMMS pressures can only be trusted outside of L values around 6. Inside this distance, background levels become significant and cause the reported pressure to be too high. There is essentially very little particle pressure in this region anyway. The next panel shows the total pressure, as computed by summing the LEMMS and CHEMS pressure spectrograms in the above panels. The units for the pressure are still the same. The next panel is a LEMMS energy-time spectrogram based on these LEMMS A and P channels: A0 through A7 and P2 through P8 excluding P4. These channels cover an energy range of 27 keV to 59 MeV and are averaged into 120 second bins. The units are particles/sec/cm^2/ster/keV. Directly below this LEMMS spectrogram is a thin panel showing times of potential light contamination for LEMMS. Red indicates times when the angle between the LET boresight and the Cassini-Sun vector is less than 60 degrees. Black and gray both indicate that attitude data could not be obtained to make a determination. The Cassini MIMI Data User Guide discusses LEMMS light contamination in more detail. The bottom three panels show the position of Cassini relative to Saturn in the KSM frame. The first plot is a top view, with the Sun to the left. The blue trace is the projection of the bwo shock into the X-Y plane, and the brown line is the magnetopause projection. The equation for the bow shock was obtained from Went, et al, 2011, A new semiempirical model of Saturn's bow shock based on propagated solar wind parameters, DOI: 10.1029/2010JA016349. The magnetopause used is from Kanani et al, 2009, A new form of Saturn's magnetopause using a dynamic pressure balance model, based on in situ multi-instrument Cassini measurements DOI: 10.1029/2009JA014262. In each of the trajectory plots, Saturn is in the middle, and the actual orbit of Titan is shown (centered on the time of the data, but extendeing several days before and after so that the whole orbit can be seen). The location of Titan at the middle of the day of the data plots is indicated with a small red circle. The trajectory of Cassini is shown in black, and the part of the trajectory covered by the data is shown with a thicker blue line. The position of Cassini at the start of the data plot is indicated by a red X. In the KSM YZ projection, the magnetopause and bow shock are shown projected into the plane containing the spacecraft. Note that if the spacecraft is far enough inside or outside, these boundaries may not appear. The KSM frame is defined as follows: KSM, +X points from Saturn to the Sun. +Y is the Saturn dipole axis crossed into the +X axis. (In practice, the spin axis of Saturn is used in place of the dipole axis.) The +Z axis is then +X cross +Y. 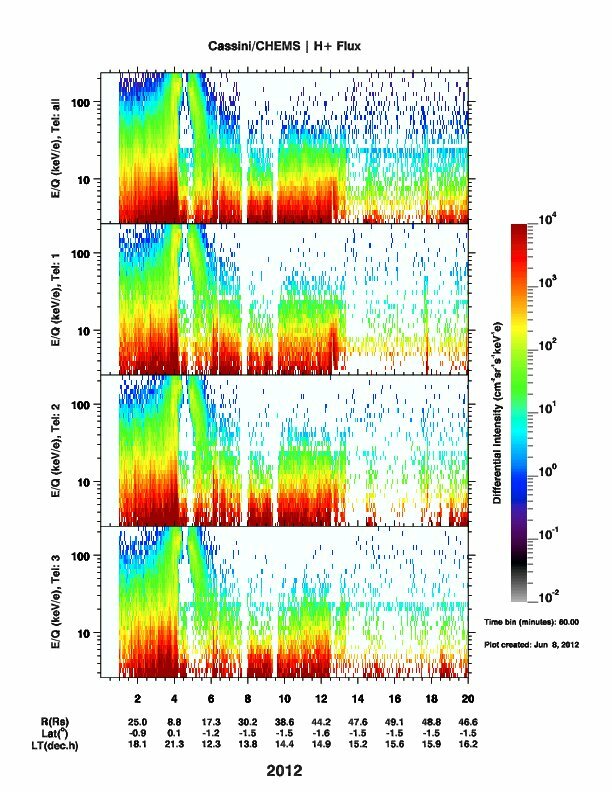 PHA Spectrograms: This plot shows energy-time spectrograms for the LEMMS PHA electron data (top panel) and LEMMS PHA ion data (second panel). The ions are almost always protons, and these come from channels 8 through 62 in the LEMMS PHA data. For protons, these channels have an energy range of 25 to 780 keV. The electrons (the lower of the two data panels) come from the LEMMS PHA E channels 15 through 62 and the LEMMS PHA F1 channels (26 through 59) and have energy ranges of 20 to 410 (for E channels) and 205 to 1700 keV (for F1 channels). Note that there is some overlap. The thin plot between the two data panels is a status panel indicating when sunlight contamination may be present in the data. This status panel is color coded such that green indicates the data is likely free of sunlight problems. Red indicates a likely contamination problem. Black and gray both indicate that attitude data could not be obtained to make a determination. The Cassini MIMI Data User Guide discusses LEMMS light contamination in more detail. There is also a panel showing angles between the LEMMS Low Energy Telescope (LET) and various other vectors. The green line is the SZS longitude of the LET boresight. The black line is the latitude of the LET boresight in the SZS frame. The blue line is the Sun angle - the angle between the LET boresight and the Cassini-Sun line. This is the angle used to determine possible sunlight contamination. The X axis is labeled with the time of day and the local time (in SZS), and also the radial distance of Cassini to the center of Saturn. The bottom three panels show the position of Cassini relative to Saturn in the KSM frame. The first plot is a top view, with the Sun to the left. The blue trace is the projection of the bwo shock into the X-Y plane, and the brown line is the magnetopause projection. In each of the trajectory plots, Saturn is in the middle, and the actual orbit of Titan is shown (centered on the time of the data, but extendeing several days before and after so that the whole orbit can be seen). The location of Titan at the middle of the day of the data plots is indicated with a small red circle. The trajectory of Cassini is shown in black, and the part of the trajectory covered by the data is shown with a thicker blue line. The position of Cassini at the start of the data plot is indicated by a red X. In the KSM YZ projection, the magnetopause and bow shock are shown projected into the plane containing the spacecraft. Note that if the spacecraft is far enough inside or outside, these boundaries may not appear. The following frame definitions are used. Fpr KSM, +X points from Saturn to the Sun. +Y is the Saturn dipole axis crossed into the +X axis. (In practice, the spin axis of Saturn is used in place of the dipole axis.) The +Z axis is then +X cross +Y. For the SZS frame, +Z points along the Saturn spin axis. +Y is +Z crossed into the Saturn-Sun line. +X is then +Y cross +Z. MP4 movies displaying averaged ENA image skymaps for one species and time-of-flight (TOF) combination for select time ranges. The movie shows ENA enhancement and a bright auroral bulge. Not all mentioned species and TOF conbinations are yet available but are included in case movies of that type are added in the future. ENA images are collected when the voltage on the INCA collimator is high, typically 4kV. This excludes ions with E/q values less than ~180 to 200keV/q. The value displayed is the log of the image intensity in counts/(centimeters squared*steradian*seconds*keV). The color bar limits are set to a common minimum and maximum value over the entire movie, chosen to bring out the salient features over the time covered. These values typically change from one movie to the next, based on activity levels and orbital position. Each original image N x N pixel image (where N is usually 32 or 64) was transformed into the Saturn frame, a frame dynamically defined as follows. The primary axis is the CASSINI spacecraft-to-Saturn vector and is labeled X. The secondary (Z) axis is the Z axis of the IAU_SATURN frame (the Saturn spin axis). The Y-axis completes the right-handed system. The skymap display is defined to display every frame with the Z axis up, X axis points into the page, the Y axis to the left. So in the skymap projection, into the page is the spacecraft to Saturn vector, Z axis (or up) is the Saturn spin axis. Occasionally, for Titan flybys, the image was transformed into the Titan frame, a frame dynamically defined as follows. The primary axis is the CASSINI spacecraft-to-Titan vector and is labeled X. The secondary (Z) axis is the Z axis of the IAU_TITAN frame (the Titan spin axis). The Y-axis completes the right-handed system. Typically, though not always, the orbit of Titan, Dione and Rhea (dotted line), Titan center (dot), and the axis for Saturn equatorial system frame (white, centered at Saturn) are displayed. The definition of the Saturn equatorial system frame has the primary axis, labeled Z, parallel to the Saturn spin axis. The Y-axis is then defined as the cross product of this vector with the Saturn-Sun vector. The X-axis completes the right-handed system and is directed roughly sunward, lying in the plane containing both Z and the Saturn-sun vector. The pink axis (when present) is the Saturn Kilometric Radiation frame. Due to the work of the RPWS team we now have several Saturn Kilometric Radiation frames available for use. The Z-axis is coincident with the instantaneous body rotation vector (spin axis) of Saturn. At the bottom of the page, the Rs=radius to Saturn, Lat=latitude in IAU_SATURN frame, LT=Saturn Local Time, L=L value, local time of Cassini relative to Saturn, Lon skr-wl= Longitude of Cassini in the Saturn Kilometric Radiation (western longitude) frame. These measurments are calculated at the start time of the first image. A SLS4 Longitude system based on a tracking filter analysis of the rotation modulation of Saturn kilometric radiation. D.A. Gurnett, et. al. 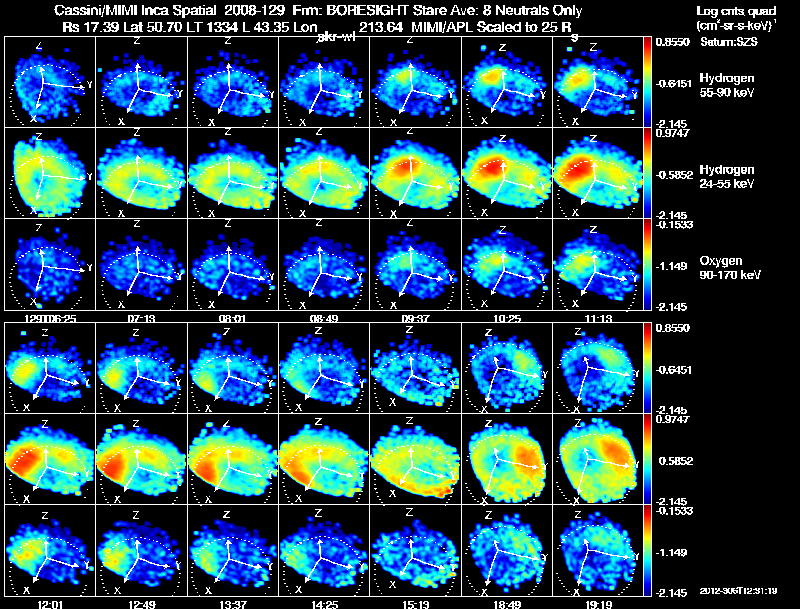 In an effort to make an INCA data product directly comparable to data products from the LEMMS and CHEMS telescopes, the images are collapsed in angle to form an image-integrated intensity. For each combination of species and energy (or in the case of INCA, time-of-flight (TOF)) from MIMI/INCA's high mass-TOF resolution images, the original image pixel intensity values in counts/(centimeters squared* steradian*seconds*keV) are averaged to a single intensity value. PNG file containing three rows by N columns of panels, where the bottom three rows are a continuation in time of the top three rows. 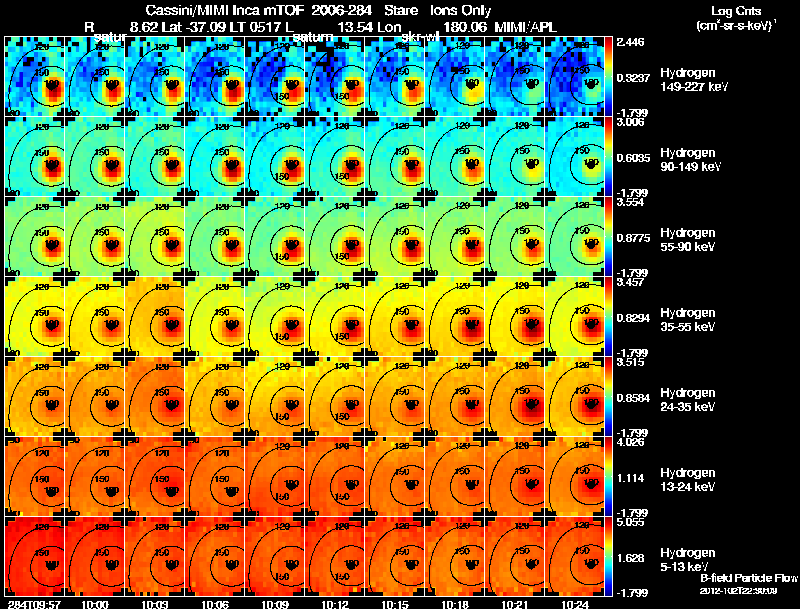 Each row contains spin averaged high spatial energetic neutral atom (ENA) image skymaps (each one accumulated over four sectors), displayed for one species and time-of-flight (TOF) combinations from the INCA sensor of the MIMI instrument on the Cassini spacecraft. Row one contains the high TOF Hydrogen images, row two contains the low TOF Hydrogen images and row three contains the low TOF Oxygen images. The high TOF oxygen in the spatial products usually has too little intensity to produce a good image, so we left it out of the browse products to allow more image space on the page for browse images that are more useful. The energy range for each TOF range is shown to the right of each row. ENA images are collected when a high voltage is present on the INCA collimator. The value displayed is the log of the image intensity which is counts/(centimeters squared*steradian*seconds*keV). The color bars for each row are independent and are determined by the minimum and maximum pixels in that row (i.e., for the entire day). Each original image was 64 x 64 pixels and was transformed into the following frame. The skymap frame is a dynamically defined frame, defined as follows. The primary axis X is the INCA boresight axis. The secondary Z axis is the Z axis of the IAU_SATURN frame. The Y-axis completes the right-handed system. The skymap display is defined to display every frame with the Z axis up, X axis into the page and Y axis out to the left. So in the skymap, using this frame, Z or up is the spin axis of Saturn, into the page is the boresight. Scaling has been applied to the image to normalize the apparent size of Saturn, if; 1. Saturn is in the field-of-view 2. 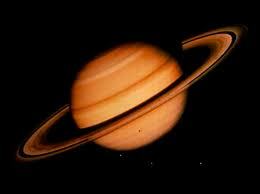 The distance to Saturn is less than 100 radius to Saturn 3. The spacecraft is not spinning. In periods where the spacecraft is going in and out of Z axis spin mode, the images will appear un-zoomed and zoomed (non spin mode). If they are visible in the image, the orbit of Titan (dotted line), Titan center (dot), and the axis for Saturn equatorial system frame (centered at Saturn) are displayed. The definition of the Saturn equatorial system frame is the primary axis, labeled Z, is parallel to the Saturn spin axis. The Y-axis is then defined as the cross product of this vector with the Saturn-Sun vector. The X-axis completes the right-handed system and is directed towards the Sun. At the top of the page, the Rs=radius to Saturn, Lat=latitude in IAU_SATURN frame, LT=Saturn Local Time, L=L value, local time of Cassini relative to Saturn, Lon skr-wl= Longitude of Cassini in the Saturn Kilometric Radiation (western longitude) frame. These measurments are calculated at the start time of the first image. PNG file containing 1 up to 10 columns, high time-of-flight (TOF) browse ion thumbnail images displayed for seven time-of-flight ranges (rows) from the INCA sensor of the MIMI instrument on the Cassini spacecraft. Ion images are collected when no voltage is present on the INCA collimator. The image species include hydrogen at TOF ranges, where the energy range for each TOF range is shown to the right of each row. The value displayed is the log of the image intensity which is counts/(centimeters squared*steradian*seconds*keV). The color bars for each row are independent and are determined by the minimum and maximum pixels in that row (i.e., for the entire day). The definition of the thumbnail frame is the primary axis X is the INCA boresight axis which goes into the page. The secondary Z axis is the Z axis of Cassini. The Y-axis completes the left-handed system. The elevation of the image goes from -60 degrees at the bottom to 60 degrees at the top of the image. The azimuth of the image goes from -45 degrees on the left to 45 degrees on the right. Each original image was 16 x 16 pixels and was expanded to 60 x 80 pixels in the PNG file. The pitch angle of INCA is displayed on top of the image as contours for the following degrees [0,30,60,90,120,150,180] in the B-field particle flow. At the top of the page, the Rsaturn=radius to Saturn, Lat=latitude in IAU_SATURN frame, LT=Saturn Local Time, L=L value, local time of Cassini relative to Saturn, Lon skr-wl= Longitude of Cassini in the Saturn Kilometric Radiation (western longitude) frame. These measurements are calculated at the start time of the first image. The seven TOF range (each one accumulated over four sectors), four sector images are displayed one above each other for the same time. The highest TOF (TOF id 0) is not a well-behaved product so it was not included in the browse product. The channel is sensitive to background, electrons, and has variable sensitivity to ions in that energy range (greater sensitivity at the edges, highly spectral slope dependent, not calibratable). Time increases from left to right. Images, taken when Cassini is spinning about the Z axis, may be flipped horizontally depending on the spin direction. This insures that contiguous images line up properly. All images in a column are flipped or not flipped and this is indicated by a grey bar at the bottom. Grey equals flipped.